Esri's Collector for ArcGIS, paired with a detailed plant database, is used to orchestrate the movement of plants during landscaping projects so that precious historical and research data is retained with each plant. Creating accurate maps has always been part of exhibit planning at Desert Botanical Garden in Phoenix, Arizona. Cartographic technology has advanced from hand-drawn maps to geographic information system (GIS) technology, and the garden has begun to employ geodesign technologies to create truly extraordinary exhibits. Desert Botanical Garden sits in the heart of the Phoenix Valley and within the northern reaches of the Sonoran Desert. The garden exhibits over 20,000 diverse desert-adapted plants, ranging from ancient towering saguaros to delicate succulents. Detailed maps of these plants are brought together with utility maps and other GIS layers in desktop and mobile GIS technologies to plan exciting trail renovations and seasonal art exhibits that enhance and protect our valued plant collections. The garden staff uses geodesign to optimize where to place art installations, new utility lines, and hardscape around precious plant collections while protecting the plants from hazards such as root compaction. Geodesign is a particular form of landscape design that earns the prefix geo because it changes the environment at a geographic scale and is informed by geospatial technologies, including GIS. While the garden’s 138 acres are, admittedly, at the smaller end of the geographic scale, the density and value of its historical plant collections, combined with the miles of underground irrigation lines and other utilities, produce a design challenge that necessitates the use of geospatial technology. 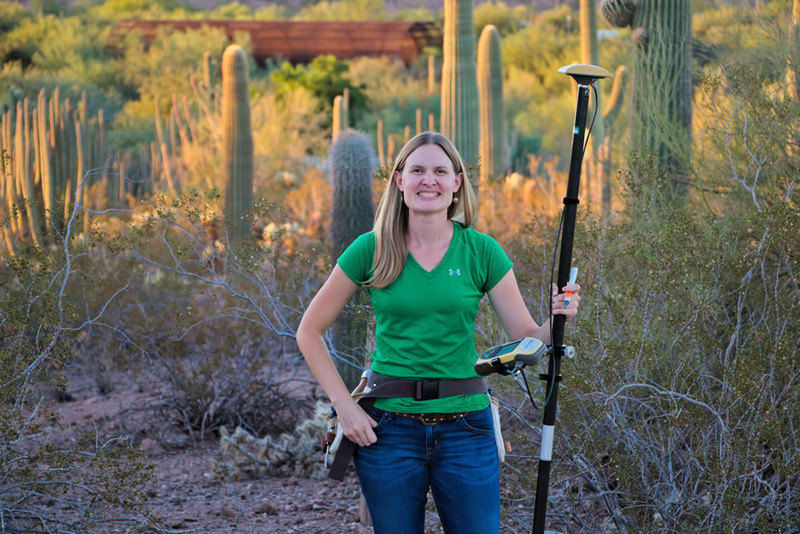 GIS specialist Veronica Nixon relies on her geospatial toolkit when she does field work at Desert Botanical Garden. 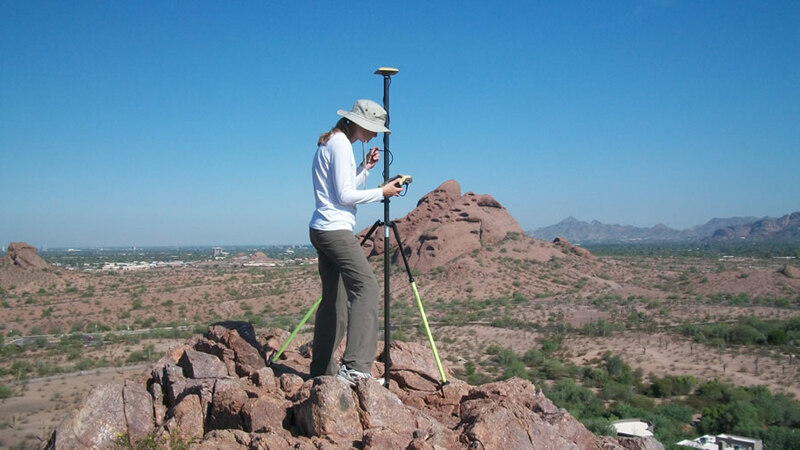 As a GIS specialist for Desert Botanical Garden, I create and manage spatial information about plants, built structures, hardscape, and underground utilities. And in my role as a member of the garden’s Living Collections team, I map our plant collections for our GIS-linked plant database at livingcollections.org. The plant database was developed by Desert Botanical Garden and Missouri Botanical Garden to harness the power of GIS and scale up our plant collections management work. The GIS capabilities of our plant database make it possible to keep our plant records accurate and up to date during extensive garden renovations. To do geodesign, I turn to my geospatial toolkit. It includes Esri’s ArcGIS for Desktop and ArcGIS for Serversoftware, ArcGIS Online, a mobile mapping and data collection app called Collector for ArcGIS, and high-accuracy surveying equipment. Our GIS data is stored in a versioned geodatabase, a configuration that supports web mapping and gives people in multiple departments the ability to edit maps and attribute data. Nixon mapped the plant collection right to the top of the 150-foot butte, where saguaros have been planted in the past and grow naturally on the rocky surface. I use the Collector for ArcGIS app, loaded onto an Apple iPad mini, and ArcGIS for Desktop to collect data, perform spatial analyses, and create diverse cartographic products, such as landscape design overlays, that allow us to view exhibit plans on top of existing utility lines and plants. Several staff members use the Collector for ArcGIS app on iPads to edit GIS layers in the field. My iPad has become indispensable, and I carry it in my tool belt whenever I head outside to update our plant map with information on recent plantings. The Mexican giant cardons in our historical plant collection date to the garden’s opening in 1939. They are the stars of the Sam & Betty Kitchell Heritage Garden that debuted earlier this year. The cardons were collected by our first director, George Lindsay, on the Baja California Peninsula. Now nearly 35 feet tall, the cardons were only 4 feet tall when brought to the garden in 1939, and they may one day grow to be over 60 feet tall. Generations of visitors to the garden have viewed the cardons, as well as many other original plantings such as paper spine cacti and toothpick cacti. Designing the Sam & Betty Kitchell Heritage Garden exhibit around invaluable plants, such as the cardons, posed an interesting challenge. We wanted to bring the garden’s history to life by gathering all the plants with historical significance in one location and better exhibit the ones already present in the space. 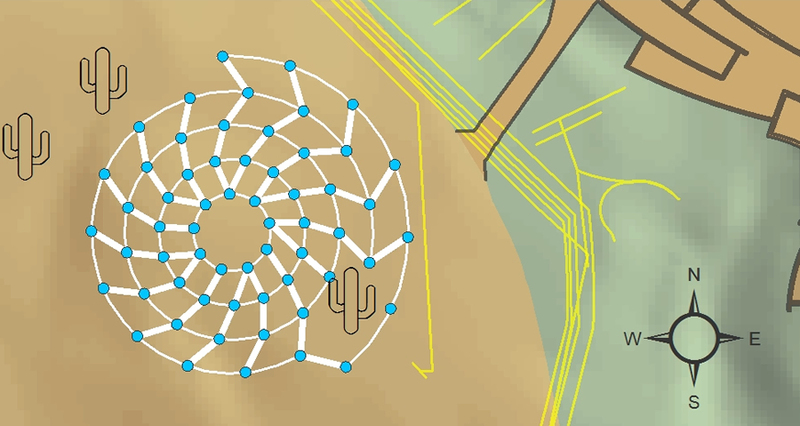 Layout specifications for the Bruce Munro Water-Towers installation were converted to a scale model in ArcGIS Desktop's ArcMap application in order to select the best location for the exhibit with respect to saguaro root zones, topographic features, and underground utilities. New plantings, hardscape, and irrigation lines had to be positioned carefully around and among some of the oldest, largest, and most beloved plants. During the planning and construction phases of the project, each plant had to be carefully accounted for to ensure that the correct plants were kept in the exhibit or moved to other areas of the garden and to avoid misplacing precious identification and collection data for the plants that were moved. While walking through the garden and inspecting each plant, our team used iPads to review historical plant records in our cloud-based plant database. These records tell us when a plant was accessioned into our collection, who donated the plant, and if it was collected in the wild. We used a custom form in the Collector for ArcGIS app to record an assessment for each plant. Approximately 1,000 plants in the half-acre area were evaluated to decide if each would remain in its current location or be transplanted to another part of the garden because they were not part of the heritage collection. These plants were remapped in their new planting beds using the Collector for ArcGIS app, and the new plant locations automatically synched with our plant database, ensuring that our plant records were up-to-date. Landscape architects create beautifully detailed renderings to help staff imagine what finished landscapes will look like. ArcGIS for Desktop and survey GPS allow us to go one step further and mark the locations of features from the construction plans on the ground in their future location. Using a technique called georeferencing, I overlay digital architectural designs onto a current map of the garden. Once the architectural drawing is georeferenced, our staff select features that they want to see laid out on the ground. After exporting the selected points to a survey GPS, I use a GPS stakeout routine to navigate to each location with subcentimeter accuracy, and I insert marker flags into the ground. The flags mark, for example, the planned location of a pathway that needs to be inspected. This technique enabled our curator of the Living Collections and our director of planning and exhibits to evaluate design elements and features in situ well before actual construction began. For example, we used this technique to strategically place our Cardon Plaza, a focal point of the heritage garden, so that visitors can capture in their photographs the full 35 feet of the nearby Mexican giant cardons. Detailed maps that show the locations of plants allow staff to carefully design exhibits that protect rare and endangered cacti planted at Desert Botanical Garden. 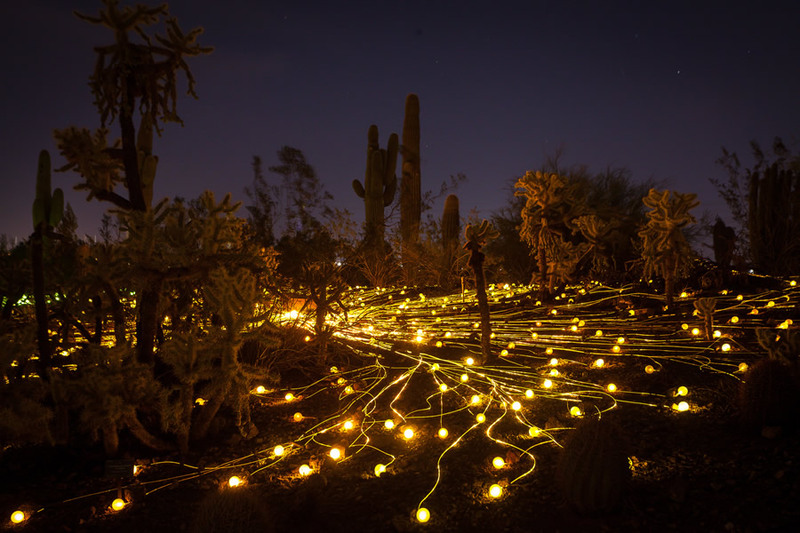 During the 2015–2016 season, Desert Botanical Garden displayed a collection of eight works by artist Bruce Munro, known for his work in the medium of light. Munro’s works are large scale, and two of the installations required geographic planning. 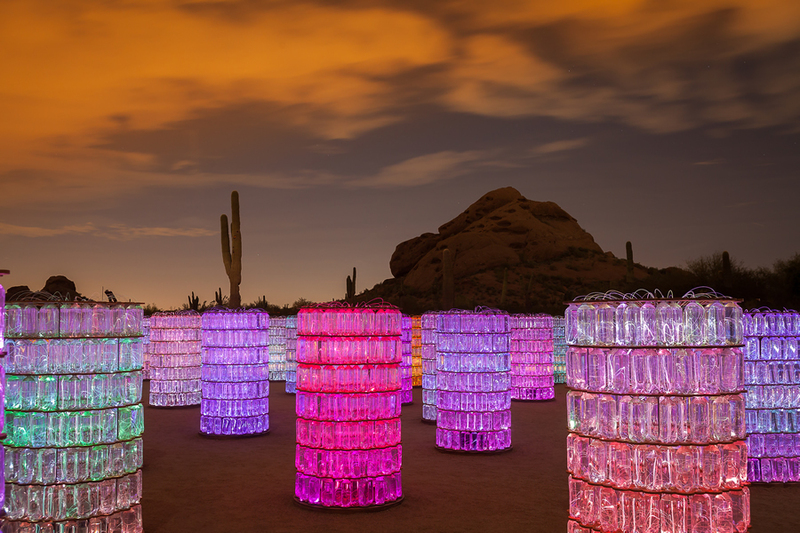 The Water-Towersinstallation was composed of 58 towers of glowing water bottles. The installation covered a quarter of an acre and had to be positioned carefully in an area of the garden that has saguaros, a wash, and critical underground utility lines. I worked with our exhibitions manager and facilities manager to convert the layout specifications for the Munro Water-Towers installation into a scale model in the GIS. Map layers depicting saguaro root zones, topography, and underground utilities were then loaded onto the GIS map. These landscape features constrained where the art exhibit could be placed. Finally, the Water-Towers model was rotated and shifted to produce three different configuration options that would protect the root zones of the three neighboring saguaros, avoid underground utilities, and minimize grading work while maximizing accessibility for guests. The configuration that the exhibits staff chose was then transferred to the GPS to be marked on the ground, and Water-Towers was installed, resulting in an incredibly engaging and beautiful display that did not negatively impact its built or natural environment. Miles of delicately colored fiber-optic lines fed into 30,000 frosted bulbs and brought to life the nighttime Munro Field of Light exhibit across eight acres of the garden’s butte. The fiber optics drew their light from 60 light boxes distributed across the area. 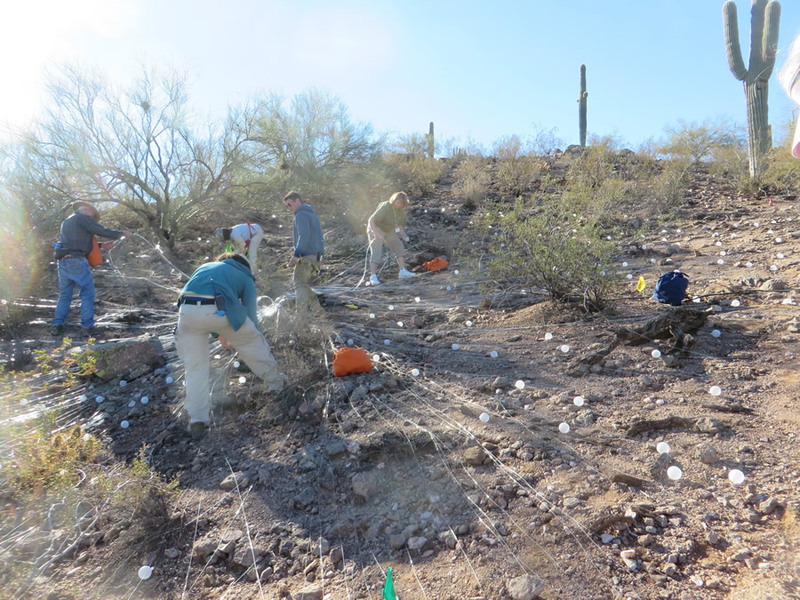 Staff and volunteers worked together to thread the fiber-optic lines across the ground between the approximately 4,000 cacti and desert plants that populate the north side of the butte. 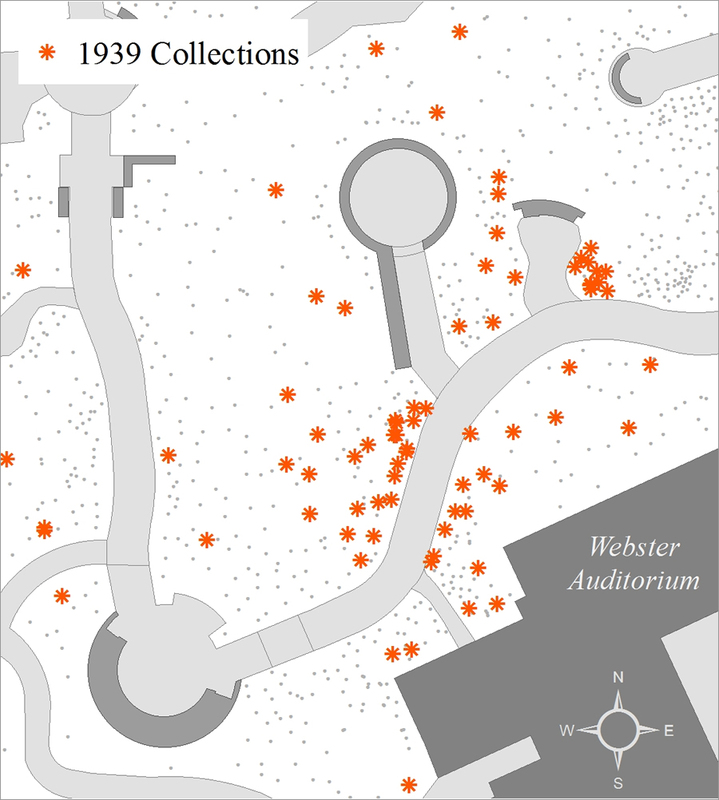 Our complete plant map, maintained in the GIS, was used by our Living Collections team to query and visualize the plants located where the exhibit would be installed. Particular care was taken during design and installation to protect the garden’s collection of endangered Nichol’s Turk’s Head Cactus, a very small cactus that can easily be overlooked. Cacti, despite their tough appearance, are extremely fragile and slow-growing plants. Therefore, staff and volunteers took the utmost care not to damage any cacti during the installation. 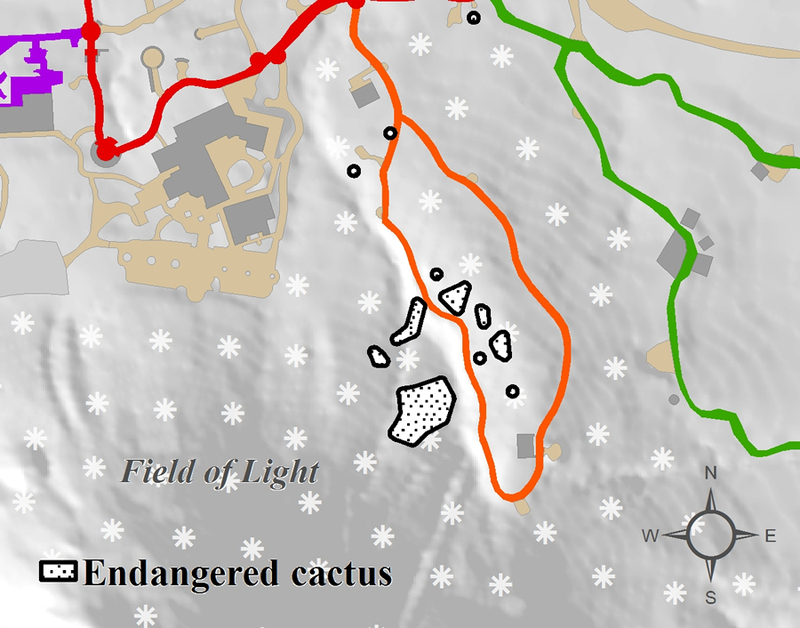 The detailed plant map enabled the team to modify where the light sources were placed to avoid being near the endangered cacti without creating visual gaps in the light display. The Living Collections team collaborated with the Exhibits staff to guarantee the safety of the plant collections, as well as of staff and volunteers, while installing the exhibit on the steep slope of the butte. Detailed maps visualizing slope, access routes, plant density, and the location of each Nichol’s Turk’s Head Cactus were created in ArcGIS. 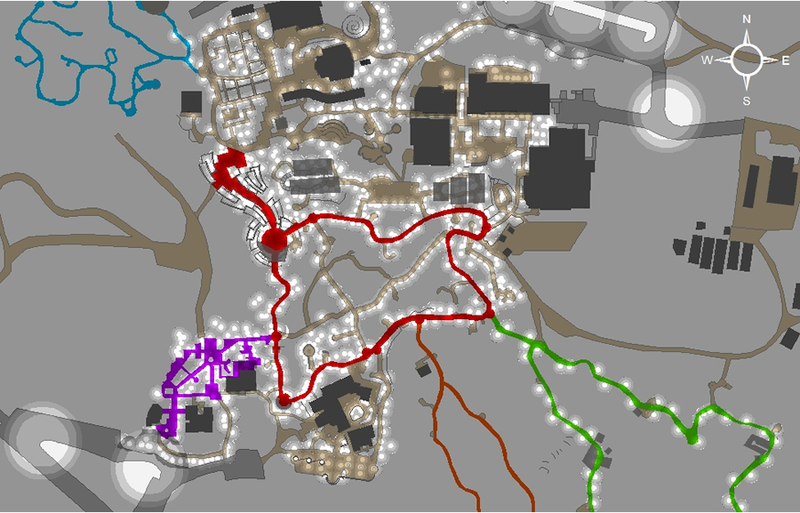 These maps were heavily utilized by the team to plan and execute the installation of Field of Light. Merging technology with exhibit planning made it possible to bring about the truly outstanding visual delight of this artistic endeavor. The garden is an enchanting place to visit after sundown because of the subtle lighting along the paths. Throughout the garden, 1,400 individual lighting fixtures line the pathways, illuminating plants and art installations. Each light is strategically placed and directed to ensure the safety of our guests while accenting the dramatic forms of desert plants at night, adding a subtle layer of enchantment to the mood. Behind the scenes, staff maintain the landscape lighting system to ensure that no area of the garden goes dark. Landscape lights are inventoried using the mobile Collector for ArcGIS app on iPads. The app helps us locate all the landscape light fixtures, particularly when plants grow over them. Using the Collector for ArcGIS app, staff add and remove landscape lights in the GIS and mark any lights that are out so that our electrician can find and repair them during the day. This map-based audit was a technological breakthrough for our landscape lighting maintenance work. This map gives the staff a view of the illuminated path and parking lot lights at Desert Botanical Garden. The lighting audit is carried out efficiently during the hour of dusk after our lights come on but when there is still enough light to spot fixtures with bulbs out. Last fall, I worked with our Site Operations staff to carry out a complete landscape lighting audit prior to the opening of the nighttime exhibit Bruce Munro: Sonoran Light at Desert Botanical Garden. The complete audit ensured that the landscape lighting system was fully functional before opening night. Geodesign and geospatial technologies have proved useful in the installation of exhibits over the past two years. The Desert Botanical Garden looks forward to discovering even more applications for GIS software, web maps, and geodesign methods as we look ahead to the creation of our future children’s garden. 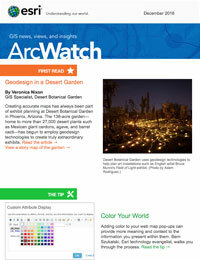 Tour Desert Botanical Garden’s trails and plant collections using this Esri Story Map Cascade app.